I'm a die-hard fans of Phantasy Star 2, it was my first JRPG on GENESYS SYTEM. I was only 8 and i thinked "OH MY GOD WHAT A HELLISH GAME"!!!! (love at first sight but never beat it). 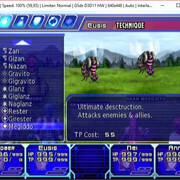 When i found the translation project of the REMAKE on pscave i silently followed the development and hoped in a FINAL VERSION that sadly never came, so when the project stopped I GRAB CUE's tools (the only available at the time) and started fixing myself the typos. When i already FIXED a LOT of SandyLandale's REPORTs (included VAN LEADER enemy name) and ready to post a 0.8a version for all of you guys...then apperead Blaw that uploaded the final version of ALGORING and opened the french forum of the project....AND GUYS WHAT A BLAST!!! In a second i found myself all the TOOLs and KNOWLEDGE of these AMAZING PEOPLE to modify and edit EVERYTHING from the GAME..and since i've already worked on the EVENT's scripts...HALF OF THE TEDIOUS JOB was already done. 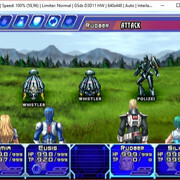 SO I'm here to present PHANTASY STAR GEN2 VERSION2. 1) ADDED ICONS for TECHs (missing in french release). 2) CORRECTED TECHNIQUEs DESCRIPTION TO DESCRIBE EXACTLY WHAT THEY DO(some are wrong also in japanese and for 1-2 techniques have same description). 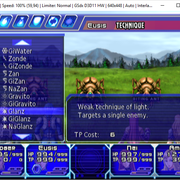 3) FIXED THE AMBIGUITY/ICONS for GLANZ & ZONDE TECHs from english (one LIGHT the other THUNDER). 4) COMPLETELY REWORKED ITEM DESCRIPTION to BE more faithful of japanese version. 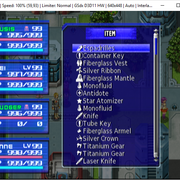 5) FIXED all SPILLOVER (ITEM DESCRIPTION & MONSTER). Mostly of item SPILLOVERs happens in the STORAGE BOX where the space is less than the game's windows. NB:The optimal/MAXIMUM MONSTER NAME LENGHT is 13 CHAR SO for someone I HAD TO CHANGE ORIGINAL using the WIKI on pscave or simply using abbreviation. I think the result is GOOD. 6) FIXED (i hope) all typos and text display issues. 7) REPLACED in the ENGLISH ASSET the POISON TEXT in UI with FRENCH ICON (much much nicer). 8) RESIZED RUDGER NAME TO FIT STATUS DISPLAY (GOOD when LEVEL is one digit, UGLY when two digits). 9) FIXED ECM Prompt menu. 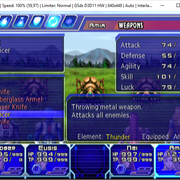 10) CHANGED "in-battle" WEAPON DESCRIPTION regarding "Element and Equip" (french version uses a different font...that i don't like). 1) TESTING, TESTING, TESTING....this is a "one-man" project so UNAVOIDABLY some errors may have occurred. 2) IMPROVING TRANSLATION: as i said this version have KIENCE scripts, a magnificent work in both traduction and simplicity but in some points a "LITTLE CLUNKY/STRANGE". I'm nor a translator/ japanese student but now we have dumped scripts...so if someone is much more prepared or have suggestions..let's discuss in the forum. 3) IMPROVING TEXT DISTRIBUTION in WINDOWS. 4) HOPE that TRYPHON seeing this new version will came back and "FIX THE ITEM DROP BUG" however, as said by Blaw, the french version is unaffected because item drop seems somewhat disabled (but i couldn't test on a real ps2). EDIT:In the latest releases ITEM DROP BUG HAS BEEN FIXED by TRYPHON!!! 5) EVERY CHANGE THAT I MADE IS QUESTIONABLE AND I'M OPEN TO DISCUSSION/MODIFICATION...i want the community to have the DEFINITIVE VERSION. After ALL the troubleshooting/improvements i WILL RELEASE A PS4 PKG (I ALREADY CONVERTED for MYSELF the 0.8 version) for MODDED CONSOLEs. FINAL NOTE: This version WANT TO BE A TRIBUTE TO THESE WONDERFUL GUYS (French/English team) that relized the original versions and all the tools. I only learned from these geniouses and assembled a more "refined" version..i'm not inventing nothing....ALL CREDITS STILL GO TO THEM.... . I DON'T WANT IN ANY WAY OFFEND PEOPLE THAT WORKED ON THE ORIGINAL PROJECT so i will post my version ONLY AFTER reading what the community/modder/author (if someone still interested) thinks about it. Last edited by Goldenboy on Sun Nov 11, 2018 7:31 am, edited 16 times in total. Nice work. Feel free to share your version. About the item drop bug, I sent a new message to Tryphon. He said he would look at it but I guess he might have forgotten. Note that I tested the game with a hacked save (maxed all the HP/etc...) so I avoided lot of battles and it's might be why I never got a crash. Maybe if I would have played all battles, I would have got crashes too. Trphon just said me he's still working on something else but that he'll fix the bug once he's done. I hoped in this answer...GREAT!!! Oh my god. Oh my god. This is the best news I've had years!! Does Algoring work for PSG:1? Where can I download it? Would it work on PSG:1 v2.10? I've been dying to fix up reported typos and release a v3.00. Edit 1 - Doing some preliminary testing now, just playing around in my save. Firstly, as someone who is on the team, I just want to wholeheartedly thank you for your work, Goldenboy. But I have to bring up something I noticed: the altered tech names. GiFeuer, GiResta, and whatnot. There's a multitude of problems with them. 2. It makes it inconsistent with Phantasy Star III and my work on Phantasy Star Generation:1. Secondly, there are a number of small issues still, ones I think Tryphon might have to fix. 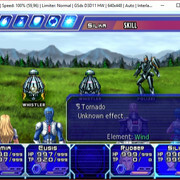 Silka's Skill "Tornado" description still seems to have the "Element: Wind" part at the bottom of the screen. And when trying to talk to Mother Brain with a dead Eusis still results in you walking away with Mother Brain attached to the back of the third teammate. (Still not sure if that's an emulator or translation glitch though.) If the text Element: Wind is separate from the ECM text, maybe we could instead replace the green "Wind" part with the wind-elemental icon. One more thing is that icons seem to be missing from Skill names. Was this intentional? If we can't insert it, maybe we should use the Key Item icon for Megiddo and other non-elemental spells. Also, I was wondering if we should change Maruera to Maerla or something similar, since in Japanese, Maruera マルエラ is an anagram of Laerma. ラエルマ I can cite my reasons for suggesting Maerla as opposed to Amreal or Marela if you'd like. OK, one last thing I can think of. Do you know if v2 has Tryphon's MTE? 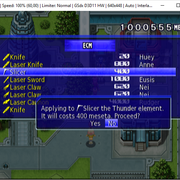 (Multi-Text Encoding) When we were doing v2.10 of PSG:1, I remember I had a problem where words would disappear at times in the inventory if you scrolled through the menu too fast. I just had that happen to me in PSG:2 in the Equipment Menu, but I couldn't replicate it. Edit 2 - I was just able to replicate it. And it's the same exact thing that happened with PSG:1. Go to the Status Menu. View a character's equipment and EXP values, then press O to view techs. (This works best on a tech-heavy character like Eusis.) Now press X and go to the Equipment Menu. The list of equipment a character is currently wearing will be blank. If PSG:2 doesn't have the MTE file, there's going to be a bigger problem down the line. I'm willing to test this further, Goldenboy, after we've had a discussion on some of these things, particularly the technique names. We really have to figure out this MTE business as well. I'm one of those modders who is very meticulous; I put thought into every single change I make. This might make me annoying to deal with at times, but that's only because I want to ensure the best possible result is delivered to people who will be playing this translation. Last edited by SandyLandale on Sun Sep 23, 2018 1:45 am, edited 5 times in total. Algoring works for PSG1 but it doesn't support it at 100% from what I know (the full support was never finished). I just know it can deal with most of the things without any problems (like the main script, for example). PSG2 hack use a MTE for some words (edited\fonts). This disappearing text bug is very strange, then, because it didn't crop up in the beta of PSG:2.
e) I Also wanted to change Megiddo ICON to have a unique one (but haven't time to find a nice one) so in the next release i'll change with yours. Last edited by Goldenboy on Sun Sep 30, 2018 6:04 pm, edited 1 time in total. Re: Menu choices in all caps - That does make sense, and I can see where you're coming from. Sometimes, all caps does help differentiate selections from descriptions. However, in this case, the description text is yellow, which is already enough difference shown. Also, please do consider also reverting Resta to Rester as Kyence had it. Rester is still pronounced Resta since it's faux-German, just like Water (Baata originally, pronounced Vah-tah) and Falser (Pronounced Fall-zah). So Blaw-, can I talk to you more about Algoring? I have all of the PSG:1 v3.00 text files in SHIFT-JIS format. (JUST the text though, not everything else.) Would that be good enough to compile a new English ISO? The only non-text things I need to do are put in the new Arcane Magic icon, and I need to know what code everyone's portraits are so I can finally add character name labels to dialogue. (Sorely needed!) I also need to put in some edited item descriptions, but that's it. Probably. Maybe convert them to utf-8 would be better as, I far as I know, algoring use utf-8 files (at least, that's how my files are encoded in). Just try and if you don't manage to make it, feel free to send me your files and I'll try myself. I personally tried to compile an ISO of PSGEN1 with one file I had translated in french and it worked fine (and if I manage to do it, I'll send you the whole folder I have for PSGEN1. It's using the same algoring version but it's already set up for PSGEN1). Last edited by Blaw- on Tue Oct 02, 2018 1:28 am, edited 1 time in total. If you could send me the whole folder, I'd very much appreciate it. I don't have the graphics at all. I'm not even sure how I'd go about inserting the icon for Arcane Magic right now, honestly. Edit - I have some icons that need to be added as well, but I don't know if that will be a problem. I apparently do already have the icon files. Last edited by SandyLandale on Sat Sep 29, 2018 6:47 pm, edited 2 times in total. Weekend....Time for a new release!!! Thanks to SandyLandale's precious tips I've made some adjustments. 1) FIXED Rudger SPILLOUT in "BATTLE MODE". 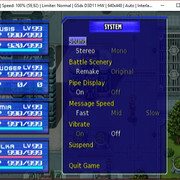 3) FIXED Prompt Screen in the "classic game" (SELECT button during play). 4) RE-ADDED ICONs for Skill Names (i totally forgot in the first instance). 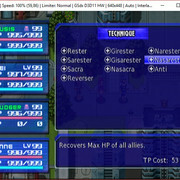 5) ADDED ARCANE ICON and used for Megiddo and Rudger's Skill (for SULFUR i decided to use the bio-organic one). 6) REVERTED BACK Menu CAPITAL LETTER to their original form (Yellow-White contrast is enough no need of CAPITAL LETTER). IT'S a PCSX2 EMULATION GLITCH or an "ORIGINAL GLITCH", in both cases i think it's not our DUTY TO FIX THIS ...Sadly i haven't a real PS2 to do another TEST and exclude PCSX2 emulator. Goldenboy wrote: Weekend....Time for a new release!!! Awesome! This looks great, and I'll start testing it soon. One thing is I recommended the Arcane Magic icon for Sulfur because it does work on all 3 enemy types. The Bio-organic Magic icon makes sense, but it might lead people into thinking it can only be used on organic enemies. Then again... that might not be a bad thing, since you can paralyze Dark Falz and Mother Brain using Sulfur. Makes Huey into the most broken character. Edit 1 - I can confirm that the new MTE works. Thanks so much for all your hard work, Goldenboy! If you haven't added yourself to the credits, by all means, please do! Edit 2 - I'm gonna start giving notes in a bulleted format so they're easier to read. - Fields no longer use the Field icon. They're belts that generate force fields, so the armor icon doesn't necessarily make sense. - When you confirm that you want to load PSGEN1 Clear Game data, it still says "Loading Clear Game save." 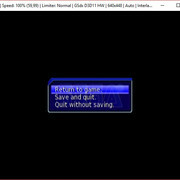 The game is actually telling you that it has already loaded a Clear Game save, so I think this should say, "Clear Game save loaded." - Here's another small issue I noticed in the beta that hasn't been fixed in v2 yet. SandyLandale wrote: I remember it was reported that the Plasma Field, when used as an item, casts a Gadge spell when used as an item. Chi89333 brought an item list to my attention that pointed out the Plasma Sword also uses a Gadge spell when used as an item. So I decided to puzzle out which casts what and I have that now. I don't have the Plasma Sword anymore to check its description, but I can see the Plasma Field still says "Unknown details..." rather than "Casts Sagadge." 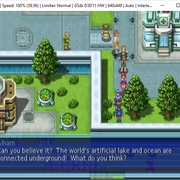 - After defeating Mother Brain, Lutz still says, "By Tajima's light, you have saved the people of Algol!" It should say, "By Tajim's light, you have saved the people of Algol!" Master Tajim was never officially known as Tajima originally, only Tajim and Tarzimal. We had decided on using Tajim.